Here’s the Samsung GT-S5222R solution for charger no response, a not charging problem on the phone. This will happen if the device suffered wet or water damaged. Note: Charger no response or shows no battery charging icon is also cause by a weak and fully drained battery and or a damaged battery charger. This solution will only work if the device can fully turns On but it doesn’t charge up when the battery charger is plug-in. The solution below may help on how to fix such charging problem if occurred.The highlighted components holds for cahrging operation of the device if one of these components become damaged or faulty it will result to a not charging problem. 1. 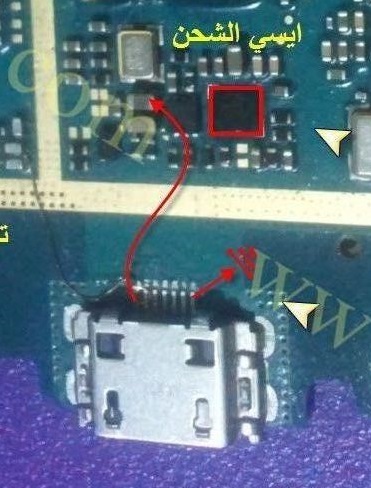 Check the charging pin connector, clean it, including the terminal pads on the PCB board. Replace the charging pin connector if already damaged. 2. Check also the battery terminal connectors, clean it if necessary. 3. Get your multimeter then check the fuse, coil, doide and capacitors for possible shorted and open circuit. Replace if found damaged.